The 2019 Golden Horse models. Good news, bad news for me personally, on the Golden Horse front. It is apparently about to be released. The Rado rep will have at least one in Saskatoon that I could see. At the beginning of May. When I will be in Jamaica. Some answers. No chronometer. Powermatics in the l and Xl size and 2671s in the mid-size. 37X 44.8 X 10.8 This size is only available in the LE, of which there are 1957 pieces. All models have box sapphire crystals, so they will strongly resemble the original acrylic ones. All models appear to have full size rotating anchors. Case construction is steel. The models that feature bezels have either Ceramos or plasma High Tech ceramic bezels. All models have 50 m WR. Prices range from 1700 CHF for the two tone dialed LE on leather up to 2600CHF for one of the women's Jubilé models. Most of them, even on bracelets seem to be in the 1900-2100 range. There seems to be a total of 16 variants across three case variations and three case sizes. There aare two bracelet variations, a BoR and a modern style, plus strap options. The Rado rep was right when she told me it would be coming back in a big way. This is a full line. 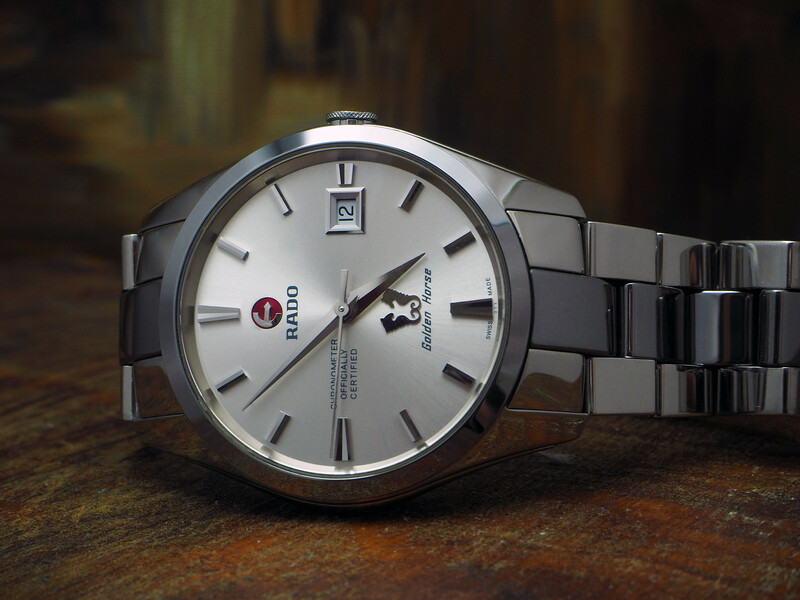 I am pretty happy to see the first iconic Rado model back and admit I may have my eye on one ro two of the variants. Last edited by Henry Krinkle; 04-10-2019, 05:50 PM. Fascinating. I would have thought we'd see some HyperChrome in there. IMG_20190410_104302_875.jpg IMG_20190410_104431_235.jpg IMG_20190410_104523_555.jpg IMG_20190410_104503_427.jpg IMG_20190410_104416_952.jpg IMG_20190410_104515_315.jpg IMG_20190410_104539_335.jpg IMG_20190410_104549_444.jpg Some quick cellphone pics of the sales rep's data sheets. That's a comprehensive line up! Thanks for the info Henry. Yes it is pretty comprehensive, but as always it's not exactly what one wants, not that I'm looking to buy any time soon. In any case, thanks for sharing Henry. What are the sizes, Henry? Any news on that? I agree the BoR looks great, Tim. The black and red one is 37mm. The others are all 42mm for the mens and 35 for the womens sizes. I am pretty eager to see the 37mm LE, which is also the only one with a Seahorse back. All the others are display back. I would also like to see the green, blue or grey 42mm with that interesting bezel interpretation. It does strike me as a little strange that they have put the big anchor on the mod bracelet and the small anchor on the vintage style. Maybe it's because of the Hyperchrome GH? Last edited by Henry Krinkle; 04-11-2019, 11:08 AM. Bugger! Guess I'll miss that too. I can't even get the Captain Cook Mk2 here in Saudi. None of the ADs have the 1965 either and I can't get them interested in inquiring with Rado Switzerland. They just shrug and say "Not for Saudi Market". Of course if you want a TC bezel in gold finish with 'gemstones' on the dial - this we have a lot of. Hahahaha.